Guttering and rainwater downpipes ought to be very simple to assess and aren’t usually expensive to put right. But you need to be aware of them as they can cause very expensive problems with damp and rot inside the house. A quick visual check: Do they look level? Corners in particular often drop, opening joints and causing overflows. If there’s a roof window, pouring a bucket of water out will show if it flows away correctly. There are two main types, modern plastic and older cast iron (with new cast-iron and aluminium also available). The main problems with plastic is UV damage, joint leaks and sagging. UV from the sun oxidises it and it becomes brittle. Gray plastic which looks very bleached on top may need replacement soon. 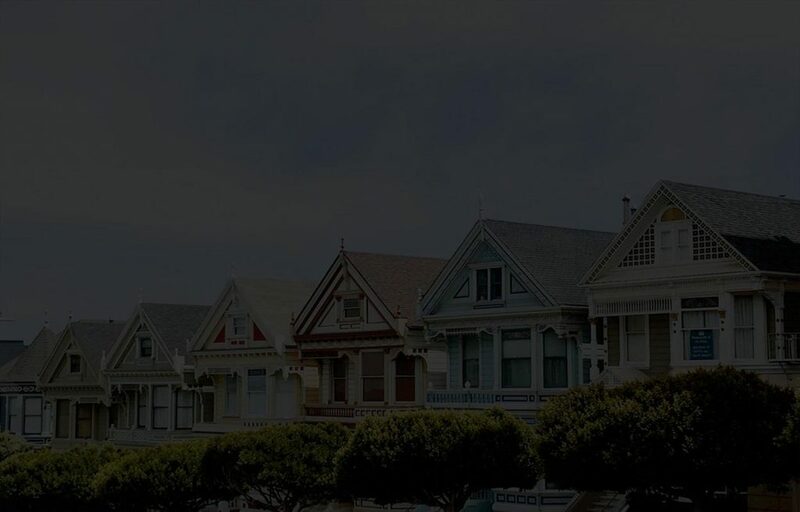 Sagging occurs when there are too few clips (gutter should be clipped every 600mm). The sag causes water to puddle, and the extra weight causes more sagging. The deflection can make the joints work loose or water overflow and soak into the walls. Green algae stains at the joints or below them on walls, or peeling paint just below the joints, indicate leaks. The joints are push-fit only and can sometimes be repaired with some guttering silicone, or better by cannibalising the rubber seal from a new gutter-joint if you can find one which matches. Unfortunately there are many different makes and matching old material can be challenging! The main problems with cast iron are rust, joint leaks and downpipe blockages. Gutter sections are joined with a bolt and red-lead putty (very poisonous and not used today). 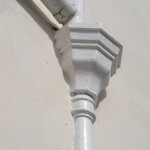 If the gutter is too rusty it can be replaced with plastic, or with new cast if required for listed buildings. Signs of joints leaking are similar for plastic (above), plus rusty deposits and stains down the walls. They can often be repaired by cleaning out the joint, treating with Kurust, and re-sealing with special silicone and a new 6mm bolt. Cast sometimes leaks at the downpipes too, rusty deposits below the joint indicate this. Blockages occur because downpipes are undersize, below today’s standard 75mm. Also some disappear straight into the ground without an open grate and a ‘trap’ (U bend) to catch debris such as moss and leaves. If the house doesn’t have these, reckon on fitting them. A blockage below ground can back water all the way up the pipe where it squirts out of joints at high-pressure or sometimes even makes it to the top! Cast iron gutters set into masonry can corrode with the oxidising action of the cement, and invisibly leak into the walls. Ideally they should be open all the way round, but if there’s no evidence of damp inside there’s no immediate need to change them. Another common problem is that a gutter becomes loose so that water discharging from the roof over or under-shoots. None of these jobs are particularly expensive (unless using new cast iron or aluminium and/ or scaffolding). I usually do it off a ladder but not all builders are as confident with heights. On steeply sloping ground or with a third storey I want scaffolding, which puts costs up. A quick note on building regs: Grey-water from sinks and baths etc should remain sealed from the air as it drains into the soil pipe. It isn’t supposed to go into an open hopper for health reasons, but it’s still permissible if it was built that way before the regs came in. Some areas have separate systems for storm- and waste-water. Next week I’m considering assessing windows and doors.